On top of that preparation, the Eagles now possess a shared mission statement that sums up the intent of the club. Together we strive for RESPECT to each other as teammates and respect to others [within and without] our club and sport. We are INCLUSIVE of everyone no matter their background or ability. The West Lothian Eagles now boast player numbers that are potentially the largest of all Scottish clubs, largely due to the growing numbers of their women’s team. With the prospect of their women playing in this year’s Haggis Cup – just eight months after their inception – the club’s growth continues at an impressive rate. After their initial match against the Tigers, the Eagles will face the Kingdom Kangaroos (away, 4th May), Glasgow Sharks (home, 25th May), Greater Glasgow Giants (away 15th June), Edinburgh Bloods (home, 6th July), Kingdom Kangaroos (away, 13th July) and Greater Glasgow Giants (home, 27th July). 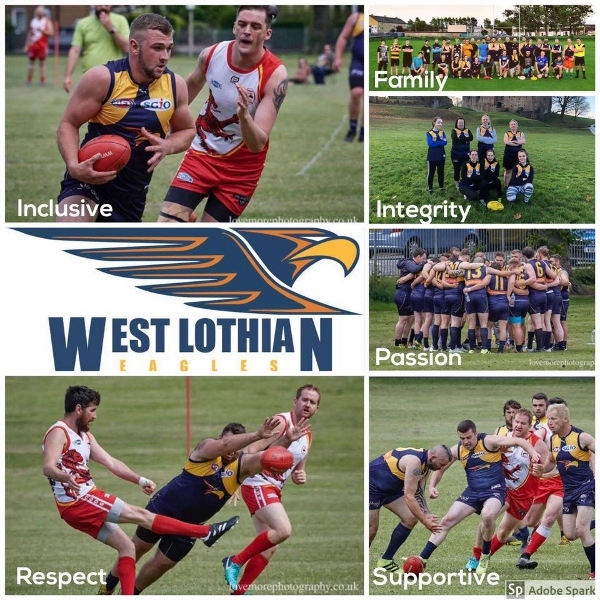 It will be a massive year for the Eagles, with other events and occasions planned across the year for AFL Scotland’s newest club.